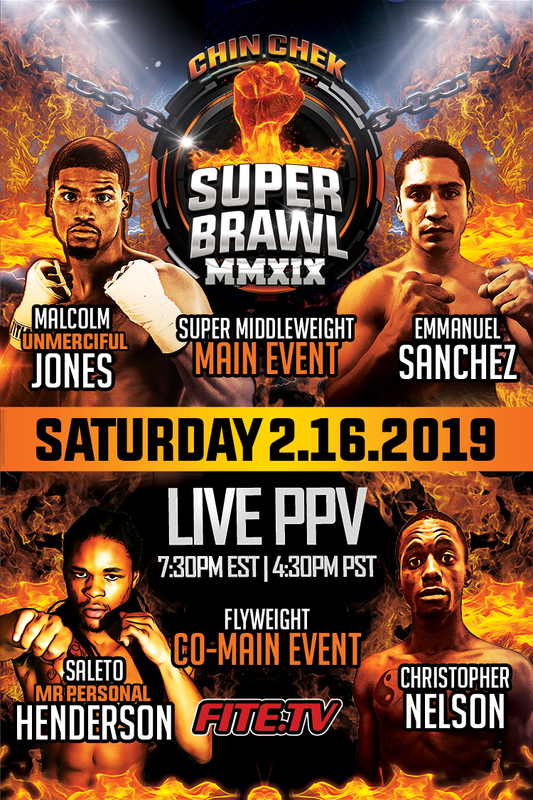 INDIANAPOLIS, IN, UNITED STATES, February 16, 2019 /EINPresswire.com/ -- Indy Boxer Malcolm "Unmerciful" Jones and Michigan's Emmanuel Sanchez will face off at the main event showdown Saturday, February 16, 2018 at the Tyndall Armory, 711 North Pennsylvania Street in Indianapolis. The super middleweight 10-round bout will be live streamed on FITE.TV and presented by Chin Chek Promotions. Doors open at 6 p.m.EST. The co-main bout features Flyweights Indiana's Saleto "Mr. Personal" Henderson v. Kentucky's Christopher Nelson for 6 rounds and NABC Great Lakes Welterweight title fight Rakim Johnson v. Pablo Sanchez for 6 rounds. "Chin Chek Promotions is back for Super Brawl and the recognition of the 2019 Indiana Boxing Hall of Fame Inductee and Boxing Legend Angel Manfredy and Former World Champion Lamon Brewster on FITE.TV," said Dominic Brogan, founder of Chin Chek Promotions. "We will also provide free access to the undercards beginning at 7:30 p.m. on February 16." Jones, 26, the Indianapolis hometown contender, steps into the ring with a record of 12-1 winning 5 of his last 5 fights. He currently ranks No. 17 in the USA. Chin Chek Head Trainer Kenny Walker states, "Malcolm is stronger, looking very sharp, and his mental focus is second to none. With this fight against Sanchez, we are going to show fight fans why we changed his ring name from "KO" to "Unmerciful." "Malcolm delivers power punches to his opponents," said Chin Chek Coach Ali Khalif. "He is an aggressive fighter who doesn't shy away from contact, most importantly, he has a high boxing IQ." On the main event card is 31-year-old Emmanuel Sanchez with a record of 7-11. The Grand Rapids, Michigan native is a southpaw. "Chin Chek is the only consistent game in town with top notch pro boxing matches in Indianapolis, Indiana," said Brogan who has a stable of rising stars. "Our fighters always give audiences an exciting show." 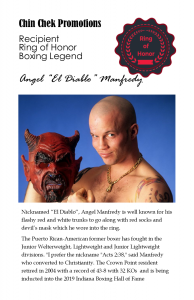 Tribute to 2019 Indiana Boxing Hall of Famer Angel "El Diablo" Manfredy and former World Champion Lamon Brewster. The main and co-main events will be live streamed through the Fite.TV app and opening with the undercards beginning at 7:30 p.m. Free to download, the Fite.TV app is on all digital streaming platforms. Promoted by Chin Chek Promotions, remaining tickets are on sale now. Tickets are available from $30 and up at the Tyndall Armory box office and online at https://chincheksuperbrawl.eventbrite.com. TONIGHT Chin Chek Promotions will honor Indiana's Boxing Legend Angel Manfredy at the Tyndall Armory. 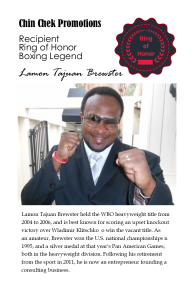 TONIGHT Chin Chek Promotions will honor Indiana's Former World Champion Lamon Brewster at the Tyndall Armory.